At the end of his book, Homer Smith included his ideas for using technology to call plays in a game. Smith was definitely a visionary. I don’t claim to be anywhere near Smith in my contributions to this game, but in this article, I’d like to share my vision for the future, hopefully, the near future. My vision involves rethinking how we practice in terms of giving players feedback so that they can make corrections. In the 2013 season we utilized my iPad throughout practice to provide instant feedback and the chance for immediate correction. I was first inspired to use the iPad at practice after seeing a video of Nebraska using it in their spring practice. My research into the idea of using an iPad at practice was further inspired by this video of it being used with a volleyball team. The coach first shows a skill that he is looking for in a drill on a video on the iPad, then the players execute the drill while being filmed on the iPad. I really liked how they alternated between iPads so that when a drill was completed, the player who just finished the drill could view the iPad for reviewing technique. As I’ve thought about the possibilities available to us in becoming better teachers and coaches on the field through fully utilizing the technology available, we can become much better at what we do. The standard of what a football practice looks like seems to be shifting. “Uptempo” has become the norm. Stopping practice to correct and adjust is frowned upon. Many coaches of the no-huddle, uptempo offense will tell you that they coach off of film because they don’t want to disrupt the tempo. Defensive coaches seem to have resigned to the fact that they will just have to deal with it. By definition, feedback waits until later. The teachable moment doesn’t come until hours after in a film session. I’m not sure we are doing it correctly. Granted, there are times when tempo should and must be the focus because that’s how it happens on game day. Tempo for purely the sake of tempo may leave us missing out on coaching opportunities. Today’s technology may bridge that gap and allow us to maintain the pace of practice while allowing for immediate feedback and correction. The challenge, it seems, is to integrate the technology while allowing for maximum repetitions during the allotted practice time. The big question is how do we accomplish this while keeping a crisp and flowing practice? Technology should be integrated seamlessly. Part of the answer may be found in not just obtaining the technology, but more importantly, in having a sound plan to use it. Let’s take a look at a possible technology plan within a typical practice session. The focus in this table is from an offense’s view point. *This is the difficult one for a football practice. Ideally, some kind of live stream can be used between two iPads with a pause and rewind. One device is recording live while an iPad at the back of the line is serving as a viewing station for the player. I haven’t exactly found the app or software that would accomplish this yet, but I have seen the technology in other uses, so I believe it is possible. 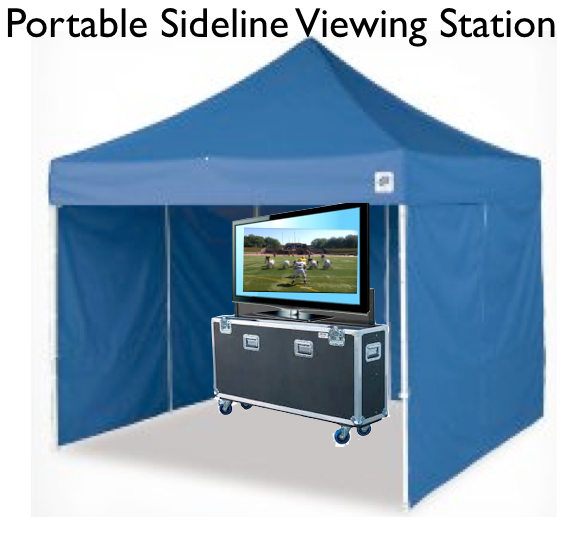 **Ideally, a viewing station is set up, possibly under a pop-up tent for glare and visibility issues. The iPad is utilized through airplay so that it is easier for a group of players to view. Managers or injured players would man the iPads. The iPad isn’t meant to be something that stops or slows down practice, but rather in an uptempo environment allows the player to understand a coaching point that was made by the coach “on the fly.” At the appropriate time when that player has a minute or so for review, he can go to the iPad on his own or with a coach to review the coaching point that was made during live action. The idea of having some application that allows for live streaming to an iPad during individual periods allows for players to quickly review their technique while they are waiting to get to the front of the line again. The goal is to increase player understanding so that execution of techniques on the field improve. I believe in the beginning, as a skill is being taught for the first time, having a coach running the drill and a coach reviewing with the player would be ideal. Eventually, players begin to see key body positions to look for. For example, we teach our receivers a double leg explosion out of their stance. It’s easy for the receiver to go to an iPad on his own an identify how he did. He can easily see if he drove off correctly or false stepped or sunk his hips. The feedback from video gives him a focus the next time that it is his turn. If there are two coaches available, this makes great use of both coaches. One coach is giving feedback live while the other is showing the video to the player seconds after it happened, further illustrating the coaching point and solidifying the player’s understanding of exactly what he must do. At any time in practice, the coach needs to be vocal and have very concise coaching points that identify an error as he sees it live. For example, if he sees an offensive lineman with incorrect hand placement, teaching the lineman to understand a word like “target” enables the lineman to go back and view the video looking for that exact error and giving him the ability to understand what he must do the next time. This is something that every coach should aim to do regardless of if there is the technology there or not. The technology doesn’t necessarily change the coaches role. The player’s role is to develop an eye for what the coach is looking for. Most staffs only have one coach at a position. Possibly a student manager, or an injured player can film the drills, but the player still needs to have a sound understanding of what the terminology of the position coach means. This is done in the installation process. The player must be held accountable for learning the terminology. Creating a library of short videos which illustrate your coaching points and techniques will help players have a better understanding of exactly what they are supposed to do to perform their job correctly. See “Flipped Coaching” for more on this topic. Having multiple iPads and viewing stations around the practice field would be the ideal situation. The reality is most of us don’t have that budget. An iPad wasn’t in our budget at BW, so I used my own. To me, the value of giving players immediate feedback was well worth using my own iPad. We did use the iPad in different drills. Players were told that the could use the iPad at any point during the drill to review what they did. That meant that filming of the drill stopped, but the drill continued. At times the player would go to the video on his own to better understand what he did right or wrong. I should not here that video is a great way to solidify the correct technique, just as much as it is to correct an error. Other times I would instruct the player to look at the video, and even go to the iPad to review it with him. Our specialists used the iPad to review their technique. Our kickers would have the student manager film the field goal/extra point periods. After, the kickers would use the iPad to review their technique so they could work on perfecting their technique during the remainder of practice. We used the iPad for inside run periods. Our tight ends coach used the iPad to review the inside run period with his players in the period immediately following inside run. He felt it was very valuable because we would be running those plays again in team, and he wanted his players to understand exactly what they were doing right or wrong so that they could perform correctly when those plays were repped again. We used the iPad in team for a view of the offensive line, TE, QB, and RB from behind. We instructed players and position coaches that they use it at any time to review a play and make corrections. At times, the use was player initiated. Hearing an offensive lineman say, “Let me see the iPad” was common. The running back coach might grab it to show the running back an aim point or footwork error. The offensive line coach might grab it and take the entire line to show the a certain defensive stunt and how he wanted them to pick it up. Our student manager was instructed to keep filming each play until someone wanted the iPad to view, and to resume filming as soon as they were done viewing it. 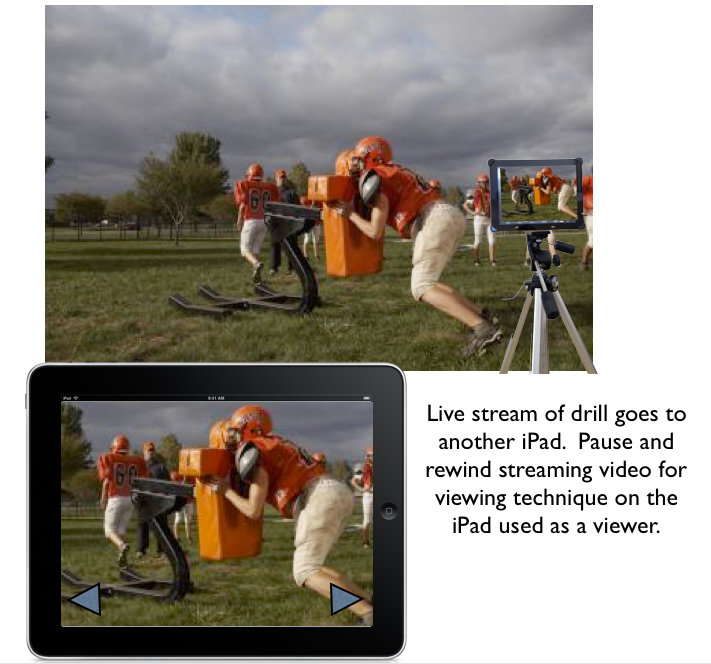 The video below shows some different ways we used the iPad at practice. While having a team of managers filming with iPads all over the field would be ideal, we found a way to make just one iPad beneficial to us. Again, the technology must be integrated seamlessly, and coaching must be concise. Doing these two things can put the technology to work for you and help improve performance on the field, which is the ultimate goal. My iBook 101+ Pro Style Pistol Offense Plays provides concepts that can be utilized in any offense, not just the pistol. The interactive multimedia book contains 229 pieces of dynamic content and a total of 30 minutes of game film. I have received some great feedback from coaches who adapted all or some of those ideas in 2013. I was able to consult with several high schools around the country who were interested in this offense and implemented this system. If you are interested in consultation on the Pistol, please email me grabkj@gmail.com. 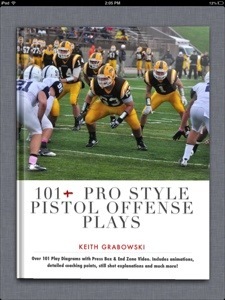 Get 101+ PRO STYLE PISTOL OFFENSE PLAYS for your iPad or Mac from the iBookstore. This entry was posted in Flipped Coaching, iPad, technology by coachgrabowski. Bookmark the permalink. Outstanding article- I also wonder if there is some use also of a Go-pro camera- we have a kid at our school with one on a radio controlled helicopter- the rapid change in technology is amazing!